CAS observing is managed by members on a private email list. This mailing list allows them to quickly notify other list members if they are going observing that day or weekend. 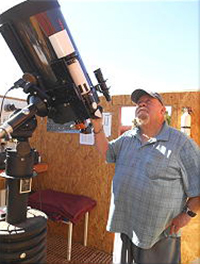 Dave has created a wonderful observing site with telescope pads, picnic tables under a shady ramada, and his own observatory. Members are welcome at any time. CAS members, Dave and Kristen Frisk, are the hosts at their two acre, fenced dark-sky site north of Williams, which has two well equipped roll-off roof observatories - as well as a warm room and two facilities for CAS members who wish to observe and then stay overnight. 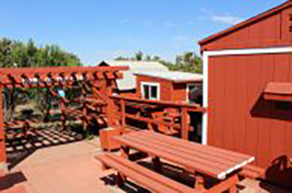 Besides the above, there is an Observing Patio, a Work Shop, and ample parking for a large number of vehicles, as well as a picnic area with six tables and two barbeques. Below is a summary of what this unique observing location has to offer CAS members. Houses a Celestron-14 on a Losmandy G-11 Gemini go-to mount. It has a Celestron 8 inch guide scope, a finder and Telrad. Also available is a computer, TV and video camera, computer guide scope, and Star Shoot autoguider. Available for a guest telescope and mount. 10’x12’ warm room with sleeping loft for two. Has tables for charts (including charts), a TV, small library, etc. This is a 12’x20’ building with queen-size sleeping downstairs, kitchen facilities, a flush toilet, and a 50” TV. There is a double bed upstairs in the loft. 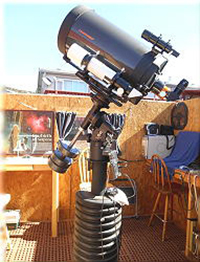 The ample patio area is available for many members to set up their own telescopes. Electric is available. Should something require fixing, the 24’x36’ shop area is well equipped. Turn LEFT onto S. Lone Tree Road and Go 0.2 miles to the intersection at J.W. Powell Blvd. Turn RIGHT onto E. John W. Powell Blvd. and Go 1.0 mile to Lake Mary Road. Turn LEFT onto Lake Mary Road and Go 8.2 miles. There is a brown sign on the right side of the road for “Marshall Lake” and “NPOI”. Turn LEFT shortly after the sign onto Coconino County 128. CC 128 is a switch-back road going up the side of Anderson Mesa. … From the Lake Mary Road onto CC 128 turn, Go 1.3 miles up the switch-back. You will see a sign for “Marshall Lake” and “Lowell Observatory”. Turn RIGHT just before the sign, and head towards “Lowell Observatory”. Go 0.3 miles up to the observing site at the top of the mesa. Take I40 east from Flagstaff to US89 (exit 201, Country Club, Flagstaff Mall).